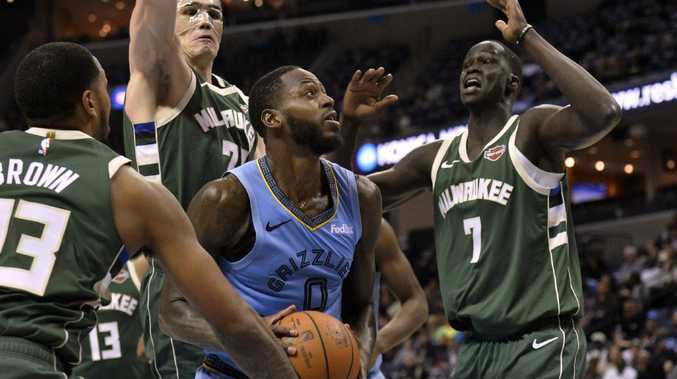 Memphis Grizzlies forward JaMychal Green looks to shoot between Milwaukee Bucks' Sterling Brown (23), Ersan Ilyasova (77) and Thon Maker (7). Australian Thon Maker is seeking to leave the high-flying Milwaukee Bucks. The Bucks have the best record in the NBA and are led by MVP contender Giannis Antetokounmpo, but 21-year-old Maker's role on the team has diminished under coach Mike Budenholzer. ESPN reported on Saturday that Maker's agent Mike George and Milwaukee general manager Jon Horst have discussed trade scenarios in recent weeks that would benefit Maker and the team. Maker, an athletic 216cm big man who can shoot three-pointers, is eligible to negotiate a lucrative rookie contract extension after this season. Milwaukee has discussed possible trade deals with rival teams before the February 7 trade deadline but is under no obligation to move Maker, the No.10 pick in the 2016 NBA Draft. The Bucks traded their other Australian, point guard Matthew Dellavedova, before Christmas to the Cleveland Cavaliers. Since January 1, Maker has averaged just 10 minutes and 3.8 points per game. Budenholzer left Maker on the bench for three of the games while Bucks forward DJ Wilson was given more court time. After starting 34 games as a 2016-17 rookie and averaging 16.7 minutes per game in 2017-18, Maker has averaged just 11.7 minutes in 35 games (zero starts) this season and averaged 4.7 points and 2.7 rebounds.